Last night heaven became a bit more glorious. 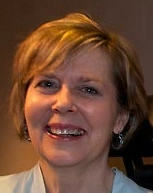 My cyber-friend Jill Hollis passed away and suffers no more from ALS. Jill is free of her wheelchair and now walks and runs on the streets of heaven. To commemorate her passing I thought that I would offer a few brief thoughts about a woman that I only knew through her blog writings and a few email messages that we exchanged. My greatest fear is not death; my greatest fear is that I will live a long time like this. My faith continues to sustain me, but it’s changed. I’ve gone from a “woo hoo” kind of faith to a deeper and more intense one. Cliff and I both strongly believe that our testimony in all of this is that you can love God (we do) and not like what you’re going through (we don’t). Every time I visited Jill's blog I came away inspired. Her courage, genuineness and transparency were so convicting. She never sugarcoated her pain but so reflected the glory of Christ as she walked through it. Jill's life so honored God. I was blessed to be her friend. Please remember Jill's husband Cliff and her children Megan and Joel in your prayers. You're the reason I started reading her blog and you're absolutely right. She'll be missed but it'll be a joyous reunion one day. May the gospel bring you and Jill's family great comfort in the this time of mourning. But the angel said to them, "Do not be afraid. I bring you good news of great joy that will be for all the people. What a great word. Faith through adversity is such an important thing. I don't know what God's plan is in suffering, but I know his word is strengthened in her testimony and those like hers. I will keep her family in my thoughts, Bog. ALS is such a horrible disease. They must be full of mixed emotions right now. Glad that her suffering is ended but missing having her physically. I'm so sorry for this loss. In times like this, I am in awe of God's grace and His deep love for us. I pray that God will sustain this dear husband and family. I'm sorry that I didn't know her through her blog, but I will go read some. Following is a lovely comment from Peyton, one of Jill's friends, that speaks to the impact that she had on the lives of those around her..
"I am sorry this happened to you and to Jill. I was often crippled with helplessness, fear, and anger along the way. Jill battled for me against that stuff though, constantly reminding me that empowerment, hope, and joy are ultimately hers and ours because of God's promises. She reminded me to stop and laugh when it all gets too serious. I'm not totally straight with God on all of this yet, I won't ever really understand, but I know he's forever patient with us and his heart is breaking for us. Jill has given me reason to fear death less, embrace life more, and to be more honest with myself. She was amazing, amazing, life-altering, forever unforgettable. God shone through her brightly, and I look forward to her rays continuing to shed light on our dark moments and magnify our brighter ones. Jill, I'm smiling to think that I'll always have a little piece of you, standing six inches from my face, invading my personal space, laying your hand on my shoulder, telling me to get a grip and to smile and be happy and to stop worrying. To keep it all in perspective." These are precious comments, Bob. I too met Jill through your blog, and count it an honor to have followed and prayed and come to love this woman of God, though we never met. I, too, was one of Jill's blogger friends. I felt as if I had known her all our lives. She had that kind of impact on those who knew her personally or only met her through blog and e-mail correspondence. I will treasure her words to me. The picture you placed on your post is beautiful - one cannot deny her joy of Jesus! I also wrote something in my blog about her before she died. I wanted her and anyone else to know what an amazing woman she was. We grieve but with the great HOPE of seeing her again. This cartoon that speaks to me..
National Coffee Day :: What Do You Drink? 60 Minutes goes all YouTube on Us! Congress shall make no law.. Arrr!! Talk Like a Pirate Today! Sometimes "like" does not always mean like..
Do You Celebrate Fake Holidays? More than the Skyline changed..
100 ways to do it wrong..